Article from Reason by John Stossel And Naomi Brockwell. The recent hurricanes took a heavy toll. The cost of rebuilding will be significant. Politicians from the areas hit now want tens of billions of dollars in aid. 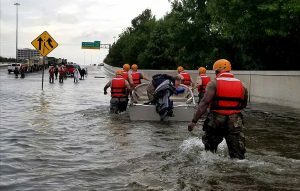 When disaster strikes, the federal government definitely has a role because the feds control resources like the military and other first responders. After Hurricane Harvey, FEMA housed 42,000 people in 692 shelters. After Irma, 13,000 National Guard soldiers helped rescue and evacuate people. That’s the kind of emergency response we expect from the federal government. AGREED. The government is NOT responsible. Politicians do not understand and never will. The purpose of government is to do things that individuals cannot do themselves. Disasters like the Texas, Florida, and Puerto Rico hurricanes and the California fires are events that individuals cannot deal with on their own. I believe there is a place for government assistance using resources that they already have. I don’t believe in baiiouts or taxpayer subsidies for those who don;t have the sense not to live in harms way or carry adequate insurance.